Vincent Mauri after realizing that he eclipsed the elusive 15 minute standard. Vincent Mauri is now one of two Ohioans and only twenty-three athletes nation-wide to have navigated a 5K course in under 15 minutes this season. 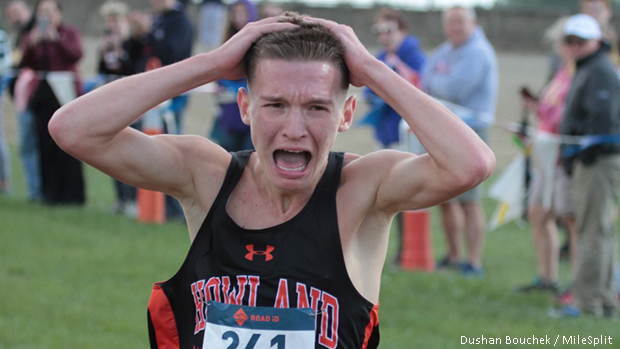 The senior from Howland recorded a time of 14:54.80 to earn a resounding win in the Division I contest at Saturday's OHSAA District - Trumbull County meet. Mauri, who recently committed to Arizona State University, has taken four victories in as many starts during the 2018 campaign. His latest performance represents an Ohio No. 1, a US No. 17, a school record and a new pr. MileSplit spoke with Vincent to gain further insight on his outstanding effort. I went to view the course on Friday and noticed that it was more dry than it had been during my previous races there. My goal all season long has been to break 15 minutes. Unfortunately, I had an injury that impacted my training and prevented me from lining-up in a few races. I started running again six weeks ago and this week I've still been at high mileage but with my pace getting down to about 5:20 per mile and with my workouts finally starting to feel really good. Due to this, I decided that today was the day that I was going for sub 15. When the gun went off, I started out slower than usual, but still splitting even through each mile. I felt fine through two miles and I just powered through the last one thinking that I wanted to run a time that was similar to what my future teammate Conant Smith posted last week. I came across the last hill with about 50m to go knowing that I was on pace to meet my goal. When I saw 14:48 on the clock, I pushed hard and gave it all I had through to the finish line.